I love this post because it’s a direct response to something I’ve talked about, as well as a look into another writer’s process. Take it away, Alexandrina! If you had asked me before April, before Miriam posted about editing (and, according to her, when Miriam edits, the world burns…!) which part of the writing/book development/publishing process I preferred, I would probably never have said editing even if you’d have paid me. Now, as an almost-full-time student, I need the money! But, seriously, in the past year I’ve experienced editing in a whole new light. And do you know why? It’s really not as bad as it first seems. Along with all those terror stories about the fearsome monster of editing, many stories exist where editing has been the vital ingredient of success. When you begin editing, you will experience a whole new world of writing, and this can be the most exciting bit – it’s that red-pen time, where you slip on a second, essential persona for the publication of fiction. 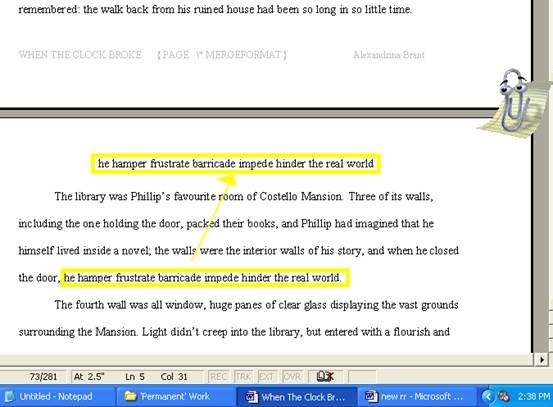 Lately rewriting my first complete novel – which I finished when I was fourteen, in 2009, and thus displayed an astounding array of amateur writing in its drafts – I’ve been using Microsoft Word’s ‘Track Changes’ feature, something I’ve found strangely addictive. You see, editing does take time, but it feels right after a while, in those moments where, as a better writer, you understand the need of cutting and changing pieces that, before, were ‘brilliant’. Editing is different to writing, yes, but it is not its opposite. Certainly, I was of this mindset when I was younger. We write, we hone our craft, we create, then we have to swap brains and go into some robot-like editing mode to distance ourselves from our ‘darlings’. I’ve discovered editing and rewriting are not like that at all. For starters, you can still love your prose whilst looking at it in a critical eye – in fact, I believe this makes for a better editor, as you want to read a story with a curious, reader’s eye. Rewriting can be fun – cringing aside – when you know the story already; it’s about finding a new way to tell something that’s already said once. Say a character is clumsy. Rewriting plays around with the idea behind the words, making them more realistic; you remove the telling phrases and replace them with an image: she juggled her lunch-box, her apple and her binder, and still managed to drop all three. Rewriting is the nailpolish on the nails, the twiddly bit of frill on the dress-cuff. I like rewriting because, as writers, we are exploring our prose, as opposed to simply churning it out. Editing, too, offers a chance to be the most creative and – in my opinion – clever. You don’t have to have any qualifications in English Literature to see that, if a character suffers (explicit or implicit) depression, they’re not going to describe a sunset as ‘sparkling’. Perhaps they might even see the sky’s hues as the colour of their own blood. Every word matters. And, yes, this is where some may say the work gets tiresome. Sometimes I have wanted to give up, but each draft is better than the last, showing that editing is certainly worth the time. As shown in the screenshot, I first like to list a handful of synonyms to see which fits the best in the sentence or the entwining idea in the scene. In this way, editing is sometimes a game, a way of working out the sentence without staring at it for too long. Editing has no fangs to bite – they’re there purely for decoration! If I had self-published my novel after I had edited it only a couple of times, I would never have discovered the intensity of the world in which I unwittingly set it (I was fifteen and not thinking about publishability at that time). Well, whether you like, love or utterly detest editing is down to opinion. But it gets better. The more you edit – your own work and other people’s – the more you understand your own editing style. When I critique, I often pull out stylistic points as opposed to ‘this character is a jerk and I don’t think he should be’ points. This doesn’t mean that one is right and one is wrong – but that everybody will have a different approach to the craft of editing. Hence the need for Beta readers. But, after six or so Manuscripts, the first draft is only one shade of the process; a point comes where, whilst not easy in the sense that writing is a breeze, the first draft can be done with no further questions (in fact, though I may not yet write 50K in the month, I did a lot better at NaNo my second time). That can’t be the end of a publishable manuscript. That task is simply not possible, unless you’re one of those super writers who craft a page a day through the sheer effort of making sure everything sits just right. We writers need editing, and, one day, we’ll all love it. Alexandrina turned 18 in May, and, in October, she will be starting her BA of Psychology and Philosophy at Reading University, England. She blogs and tweets at @Caelestia_Flora. After an A* in GCSE English Lit, she gave up following the academic side of creative writing. When word slipped out to her peers that she was novelling, one of their first questions was ‘so why aren’t you doing English?’ The closest she has ever got to a writer’s conference was LeakyCon London ‘13 (proud Slytherin), and she is always looking for Beta readers for her alternate-universe NA romance. Great post! I used to despise editing – I thought that I wrote a story the way I meant to the first time around…sometimes I get a good chuckle thinking about how naive I was when I started this whole writing thing. ;) I totally agree with you now, though – I actually enjoy editing and I think the more I edit, my work and others’, the better I get at writing, too. Editing definitely teaches you what you need to work on the next time you write a book – not just the next draft of that book.